Hi. I’m Clarissa Hollenbach Enck, the potter you see hard at work in the photograph. I produce functional wheel-thrown stoneware and porcelain pottery. Much of my work I decorate with natural subjects or calligraphy, brush painted with earth oxides before firing. I use sumi-e style brush painting with bamboo brushes. Its simplicity and relaxed feeling enhance those motifs. Clear glazes allow my clay bodies to show off their natural state, complimenting the natural subjects. My work is handcrafted in the truest sense. I mix natural, crushed clays and stone to form unique clay bodies, and I formulate and make my own slips, stains and glazes. My clay bodies are aged six months to a year before they are ready for the potter’s wheel and after they leave the wheel they spend thirty hours or more in the kiln through two separate firings at temperatures as high as 2330*F. The glazes I use are lead-free and durable for every day use. My work can be used safely in dishwashers, microwaves, and ovens that have not been preheated first; extreme temperature changes could cause harm. Please browse my web site to view examples of my work. A pottery class through the Denver Free University in 1972 rekindled a passion that began when I first made mud pies and small pots after rain storms as a child in Berks County, Pennsylvania. Following that inspiration I earned a Bachelor of Art Degree from Millersville University in 1975. 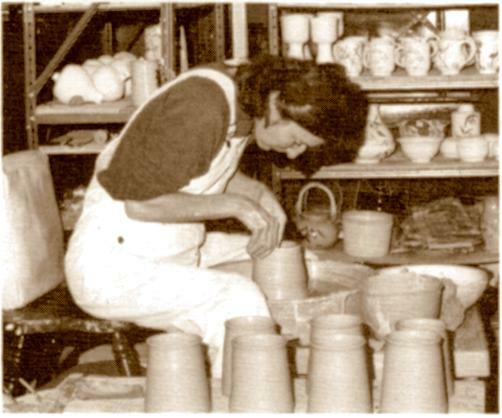 In 1976 and 1977 I worked as an apprentice potter at the Capricorner near Carlisle, Pennsylvania. I am a juried member of the Pennsylvania Guild of Craftsmen and Lancaster Designer Craftsmen and a member of the Central Pennsylvania Potters Information Group. My Studio is presently in an 18th century summer house in the Millbach area of eastern Lebanon County, Pennsylvania, where I have an annual Open House the weekend before Thanksgiving. If you visit Historic Schaefferstown’s annual Cherry Fair and Pennsylvania German Folklife Festival you will find me at my potter’s wheel demonstrating my art. My work is available for sale there as well as at various other art and craft shows in the south central Pennsylvania area. And, of course, my studio is open for sales by appointment.